When you say Alcatraz, most people think about the island in the middle of San Francisco Bay where the famous prison is located. The island also has a lighthouse on it, built to keep ships from crashing into the island or its rocky surroundings in the middle of the night. In fact, the island was the location of the first lighthouses on the Pacific coast, set up long before the infamous prison came into existence. Alcatraz was named for the birds that inhabited the island - pelicans (alcatraces in Spanish). 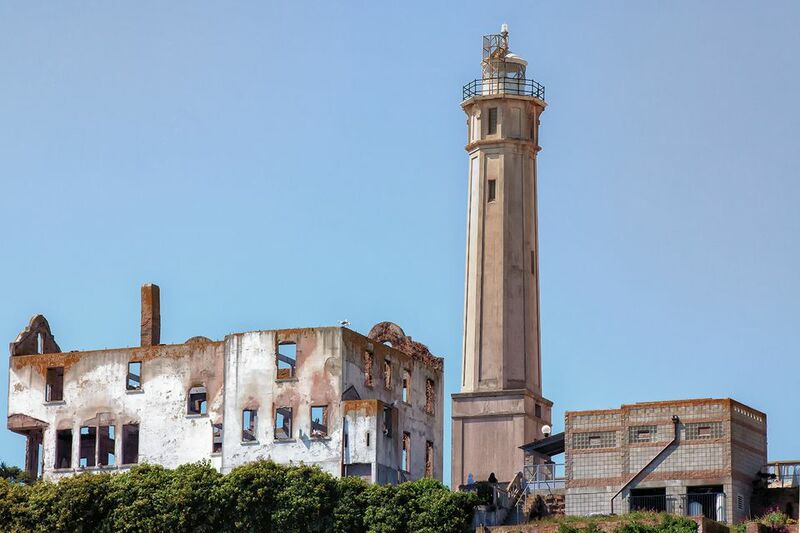 The only way to get to Alcatraz Lighthouse is to take a tour to Alcatraz Island. Most people do that to see the old prison, but you can also see the lighthouse from the outside. It isn't open for interior tours. In October 2015, the San Francisco Chronicle reported that fashion retailer Lands' End had donated money to start a renovation project, with the hope that it will someday be open to the public again. At the height of the Gold Rush many ships, large and small, arrived in the northern California bay and desperately needed a navigational aid on those all-too-frequent days when the weather became inclement. Construction on the Alcatraz Light, a Cape Cod-influenced cottage with a short tower was begun in 1852 by the firm of Gibbons and Kelly from Baltimore. It was one of eight lights planned for the west coast. On June 1, 1854, Alcatraz became the first operational U. S. lighthouse on the west coast. The original lighthouse looked like a house with a tower protruding through the middle of its roof. In California, the Battery Point, Point Pinos and the Old Point Loma lighthouses have similar designs. Michael Kassin was the first lightkeeper, earning a $1,100 salary. His assistant John Sloan made $700. The original plans called for an oil-burning lamp with a parabolic reflector. Before the lighthouse was completed, the government decided to switch to Fresnel lenses because they created a brighter light while using less oil. The Alcatraz lighthouse had a third-order Fresnel lens from France. A mechanized fog bell was added in 1856, on the southeast end of the island. It had a massive bell struck. A 30-pound hammer struck it to make the sound, lifted by a weight and pulley system. It took two men to wind up the contraption. Pulling the weight up 25 feet kept it running for about 5 hours. Electric foghorns replaced the bell in 1913. The small tower remained the only real structure on the island for many years. Damaged in the 1906 earthquake, the lighthouse was rebuilt in 1909 when the prison was constructed. An 84-foot-tall concrete tower next to the cell house replaced the original one, with a smaller fourth-order lens. The new tower is made of reinforced concrete and has six sides. The light was automated in 1962. In 1963, the island became part of the Golden Gate National Recreation area. A fire destroyed the lightkeepers' quarters in 1970 during the Indian occupation. The light still functions as a navigational aid, but with an automated electric light and an electric foghorn. The Alcatraz Lighthouse is located in San Francisco Bay. The only way to visit is to take the ferry and guided tour of Alcatraz Island. Reservations are a must. If you're a lighthouse geek, you will enjoy our Guide to Visiting the Lighthouses of California. Why Do People Want to See the Pigeon Point Lighthouse? Is Disneyland Early Entry as Good as It Sounds?